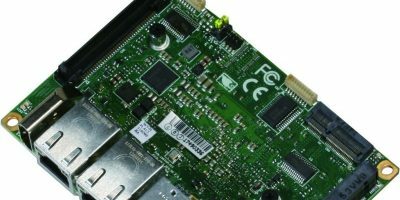 Equipped with on-board memory and storage and dual Gigabit Ethernet support, the Pico-APL4 is a compact, cost-effective single board computer (SBC) from Aaeon. It is, says the company, suitable for factory automation and IoT gateway systems. This latest Pico form factor board from Aaeon is powered by an Intel Atom, Pentium N4200, or Celeron N3350 processor. By fitting the controller with up to 4Gbyte of on-board DDR3L memory and up to 64Gbyte of on-board eMMC storage, Aaeon believes not only is the board more resistant to the shocks and vibrations regularly experienced in industrial settings, but it will also cut application development times as customers will not need to test the compatibility of external memory and storage. The flexible Pico-APL4 houses USB ports and connectors, COM ports, a HDMI port and optional eDP. There’s also a four-bit DIO to manage peripherals and an optional four-lane MIPI-CSI. For expansion there are M.2 B and E keys for the connection of additional storage and WiFi/Bluetooth modules. An optional board-to-board interface, allows customers to extend the IO interface and add a larger DIO. Aaeon was established in 1992. It designs and manufactures intelligent IoT solutions and high quality computing platforms, including industrial motherboards and systems, industrial displays, rugged tablets, embedded controllers, network appliances and related accessories, as well as integrated solutions. Aaeon also has the hardware and services for premier OEM/ODMs and system integrators worldwide. The company is an Associate Member of the Intel Internet of Things Solutions Alliance, and offers customised end-to-end services from initial product conceptualisation and board product development to mass manufacturing and after-sales service programs.
. This news story is brought to you by softei.com, the specialist site dedicated to delivering information about what’s new in the electronics industry, with daily news updates, new products and industry news.